» Near the port of Capt. Nemo, the new Disney Springs encompasses a host of modern food trends and celebrity brands. 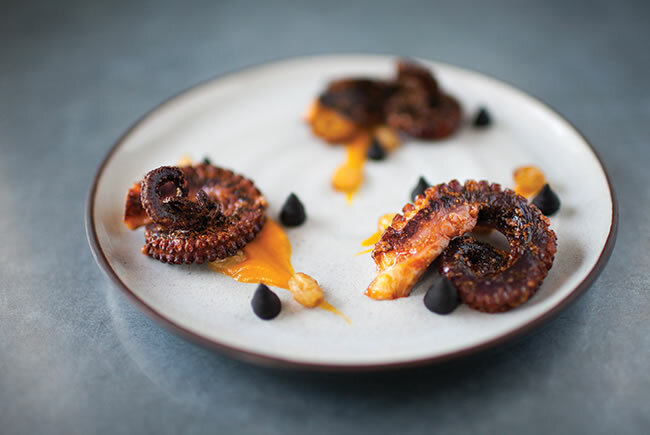 Iron Chef Masaharu Morimoto’s hamachi tacos and Peking duck, Chicagoan Rick Bayless’ Frontera Cocina’s pumpkin seed dip and carne and Oprah/FSU alum Art Smith’s fried chicken and doughnuts star in an array of more than 50 venues. That includes a gelateria, poutine stand, a fleet of Disney food trucks and longtimers Gloria Estefan, Wolfgang Puck and Kevin Dundon. » Also on the move is Orlando’s top independent crew, James and Julie Petrakis of The Ravenous Pig and Swine & Co. They just opened DoveCote, a glossy brasserie downtown, and plan another little Pig for Orlando International Airport. » No less than Norman van Aken, the Mango Gang chef who’s famous from Disney to Key West, has given celebrity shine to Mount Dora at 1921, with Southern favorites updated to match the neighboring Modernism Museum. » Jacksonville’s Maple Street Biscuit Co. found such a hunger for country comforts that it’s now cooking up its flaky namesake, sausage gravy and glass jar salads in seven locations here and another in Chattanooga. » In Tampa, Richard Gonzmart of the Columbia restaurants and Clearwater chef Chris Ponte rejuvenated sleepy Hyde Park Village with separate multimillion-dollar injections. Gonzmart’s painstaking recreation of Tampa’s beloved Goody Goody hamburger shop includes a soda fountain offering orange freezes. At On Swann, the thoroughly modern, ingredient-savvy bistro that Ponte and partners built a block away, mint-pea pesto is featured. Rooster & The Till (Tampa) Octopus — in many forms — has emerged as a star on Florida menus over the past year. Another big fish around Tampa Bay, Frank Chivas of Bay Star restaurant, has opened his biggest project yet — Marina Cantina, serving seafood with a Mexican accent on Clearwater Beach. Neglected offices on the dockside have been transformed into a three-floor restaurant seating more than 500, with great views all around. Plus a smallish fish-camp-styled eatery called Salt Cracker, and soon, Roundabout Pizza, with a 10-foot, mosaic-domed wood-fired oven. » Gainesville’s Dragonfly has proven to be the little sushi bar that could ... go big-time. First came a glamorous lounge near Disney World, and then this year a stunning sushi and ramen lounge, complete with a miniature fish market, in the splashy Downtown Doral project west of Miami. » Coral Gable’s Bulla gastrobar opened its second location there and a third in Winter Park. Salvatore Stellino, of the more than a dozen Sal’s Italian Restaurants in south Florida, also chose downtown Doral for his uptown Stellino’s, sharp and modern with Italian charcuterie, polenta and risotto. » Barbecue continues to smoke everywhere. Jacksonville’s Mojo group is opening its seventh version of urban bluesy barbecue in downtown Lakeland, this one called MojoQ. Meanwhile, John Rivers’ 4 Rivers Smokehouse from Winter Park is up to 14 locations, having just opened its latest and southernmost in Coral Springs. The owners of Tampa’s Datz, Dough and Roux have hooked up with barbecue expert Ray Lampe to open a fourth restaurant in St. Petersburg. The D’Amico family from Minnesota, which has several restaurants in Naples that range from Italian to Mexican sleek, added another this year. The Continental is actually quite contemporary, a gleaming craft steak house with top-grade Wagyu and a hot dance floor. Also starring in Naples is Greek superchef Michael Psilakis, who created the ultra-modern Italian Teatro at the Southwest Florida Performing Arts Center in Bonita Springs. This year’s Golden Spoon awards are the first since the death of Robert W. Tolf, who was Florida Trend’s restaurant editor and steward of the Golden Spoons for 34 years before retiring in 2007. Tolf, once a foreign service officer for the State Department, was an old-school raconteur who could dominate any social setting with his wit, intelligence and outsize personality. When he began writing for Trend, the number of first-rate restaurants in the state was knowable and countable. By the time he retired, Florida’s dining scene had exploded — he joked once that there were “20 restaurants that could be Golden Spoons within a 10-minute drive” of his home near Boca Raton.